Rest in agony, skeletons! Go back to Greece you pigs! Well, skeletal human-shaped pigs! For those unfamiliar with the animated series, Parn, Deedlit, and Slayn are three of the primary characters. Parn is one of the main heroes of the anim�: the "Free Knight" who serves no kingdom, but instead dedicates himself to righting injustices all across Lodoss. Deedlit, a high elf, commands the spirits and uses shamanistic magic. She is also in love with Parn. Slayn is a sorcerer and sage. These three characters have been waylaid during their journey to try to stop the resurrection, and it falls to the player to help reunite them. Strangely, however, the player doesn't actually play as Parn, which would have seemed the most logical way to build on the character recognition factor that one would think was a major reason for using the Record of Lodoss War name, at least in Japan. This won't necessarily bother people who don't really know anything about the series, but gamers who buy the game expecting to play as one of their favorite characters are going to be disappointed. As a side note, there is no choice of characters. There is one playable character. The extent to which the player can customize that character is limited to selecting a name for him. Another minor complaint deals with the cinematics, which are simply terrible. One might have assumed that a series with manga and anim� roots would use traditional cell animation for the cutscenes. Instead, pre-rendered CG is used, with awful results. The animation is stiff and artificial. When characters talk, their mouth movements are ventriloquist-dummy-like. The visual storytelling ranges from difficult to impossible to follow, with strange, seemingly irrelevant asides given the same weight as elements that seem to be key to the story at hand. On a more positive note, the localization seems generally competent, if workmanlike in places, and the voice acting is generally good (certainly better than the English dub, for those familiar with the animated version). Once the player is actually in the game, the graphics are simple and relatively dull. They are perfectly serviceable, but the color palette of the game tends to run towards earth tones, with most areas comprising only a handful of different colors and textures. This actually leads to one of the biggest problems with the game: it is relatively easy to get lost. There are points at which the player may have trouble finding a clear destination in which to head, or may have trouble determining how to reach his next intended point. The graphical similarities within each location compound this problem. It is not difficult to wander aimlessly for ten to fifteen minutes, having slain all the monsters in an area, but unsure of where to head next. Some locations are actually very linear and basically lead the player along. Others, however, are remarkably open. In a world of browns and grays, the handy dandy map is welcomed to make sense of things. Additionally, the player is given only general goals to accomplish. Once a particular portion of the game is underway, numerous sub-quests may be required to complete the player's goal, but the player is left to infer these steps with little to no help from the game. As an example, in an early section of the game, the player is told to search for Parn. He is given a general direction and a destination: the village of the dark elves. By the time the player arrives in the village, it is fairly clear that dark elves are evil. Nonetheless, in order to advance the story, the player must talk to a particular dark elf and help her rescue the village elder before he can continue looking for Parn. Gamers will doubtlessly be willing to go along with this contrived scenario, but it is highly counterintuitive. Some players may find themselves a bit confused as to whether they are actually moving in the right direction as they go through these quests. Because of the geography of some of the levels, it is also possible for a player to find himself off course by a significant amount. One area may lead into a number of different areas, only one of which is the next intended destination. Although the player is given relatively clear instructions about where to go, the instinct to wander may lead some players into dangerous areas they aren't really ready to handle. Inevitably, death follows shortly thereafter. Since death is, if not an inevitability, at least a likelihood, saving frequently is more or less a necessity. Although this is not necessarily a bad thing in and of itself, it does lead to another problem with the game. A single save requires 61 blocks of memory. Three saves will pretty much fill an entire VMU. Although Record of Lodoss War certainly isn't unique in its resource demands, the large save size is still unfortunate. In addition, as previously mentioned, saving frequently is necessary, since the player's game ends if his character dies (unlike Diablo, where the character simply returns to base, minus some money, if slain), and any unsaved progress is lost. Unfortunately, saving takes a long time, presumably due at least in part to the large amount of data being written. Saving may also require some backtracking, and the player will learn to prepare the recall spell that sends him back to base very early on in the game. The end result is that saving becomes something of an inescapable burden, rather than a natural part of playing the game. One of the things that can cause frustrating deaths for the player is slowdown. 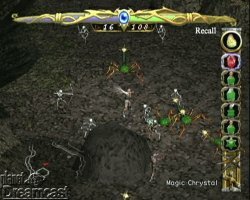 There are moments in the game when more than a dozen monsters may be charging simultaneously, in addition to multiple characters on the player's side fighting back. The result is occasional, painful slowdown. 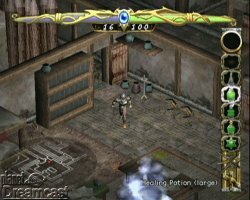 Since much of the strategy of the game depends on properly timing consumption of healing potions, lags in the game can and will kill players on occasion. While this situation only arises in instances with truly large numbers of enemies, it is still likely to be a source of extraordinary frustration when it occurs. A final disappointment actually stems from one of Record of Lodoss War's few variations from Diablo: multiplayer. Specifically, Record of Lodoss War has no multiplayer option. Given that this type of game benefits so extraordinarily from cooperative (or even not-so-cooperative) gaming sessions, it is a shame that Record of Lodoss War didn't find some way to incorporate a shared gaming experience. Record of Lodoss War isn't innovative, but the source material it is imitating is fun enough to survive a little dilution. Ultimately, Dreamcast owners looking for the Diablo experience on their console will have a good time with Record of Lodoss War. Highs: Innovative weapon system, involved adventure, and anime license. Lows: Average graphics, annoying save system, non-linear but too repetitive to prevent getting lost, and needlessly difficult due to above issues.